Made with pure steak cuts of pork, traditional British butcher's rusk, imported seasonings and all natural casing. Low in fat! Pork, Rusk (Wheat flour, Water, Salt, Ammonium Carbonate (rising agent)), Seasoning (wheat flour, salt, Spices, Dextrose, Sodium Triphosphate (Stabilizer), Yeast Extract, Sugar). A very good english breakfast sausage. i have never liked American sausage and hadn't realized how much I had missed my English sausage until I tasted these!!! They are everything I remember and more!!!! I like this better than the plain sausage, so this is probably what I will order next. Great flavor and very meaty. Very tasty. Arrived fresh and in good shape. the Old English Sausages were really good and perfect for the BBQ. I ordered sausage, bacon, and pork pies, all were awesome just as I remember growing up in England. I will definitely order again. Closed my eyes and thought I was back in England. Ate half of them hot with eggs for breakfast, and the remainder cold as late night snack.delicious both times! really good a bit milder than I remember but very good . I got he steak and ale pies and was transported to the Three Kings pub! They were wonderful; flaky crust, rich sauce, tender meat. I would definitely recommend thawing before cooking, though. Haven't made bangers and mash with the sausages yet, saving them for special occasion- the Queen's birthday? These sausages are just so delicious. I do not understand why American Butchers do not learn to make sausage the British way. I've had them before and I'll have them again the sausages are first class, as are the pork pies, steak and kidney pies, bacon and everything else I ordered! As usual everything is just fantastic! And worth every penny. they are just wonderful! So much nicer than bratwurst-which is the closest thing I have found up to now. It is even worth paying the postage! Pies and sausage were outstanding. Everything was shipped complete and on time and arrived in great condition. The food tasted fantastic. Will order again. 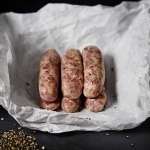 This sausage was absolutely the finest bit of banger we have ever used to make bangers and mash. Everyone loved it. It's a tradition at our house and everyone commented that this was the best batch we've had since Grandpa was alive so I was thrilled! Great, on time, good packeting. We received our order exactly as requested by 2-day Fed-Ex and were anxious to try your products. We made 'Bangers and Mashed' and absolutely loved your sausage. I think it deserves a better name than "Plain Bangers"! I look forward to trying the other products in the days ahead. We have not tried the sausage as of yet, but judging from our past purchases, we expect excellent results. OR we would not have purchased double our past order. The name says it all. Bangers and mash or with eggs and black pudding, these are the real deal. Keep up the great work. bought back memories of the old dart. My housemate is of German extraction and he insisted that we have sauerkraut with them and I was suprised how the two cultures of Old Emglish and German blended to make a great meal. I love this company have tried a lot of their products with no complaints. This sausage is excellent - the real deal. Finally great bangers and mash,instead of my homemade attempts at sausages, with an onion gravy recipe I found online. THE OLD ENGLISH SAUSAGE IS JUST LIKE WE WERE IN ENGLAND HAVING BREAKFAST WITH FAMILY. I wanted to have something special for my husbands 60th birthday party instead of the usual catered food. I found the website, called the company and was happy that the EPPC could deliver my order on time. They were polite, efficient and my 70 steak and kidney pies were a HUGE hit with all our American friends, Well done you. Review to follow later when holidays arrive ..
Everything order was kept cold. We haven't eaten it all but everything so far has been great. These are as good (if not better) than any I have had in the UK. Sausage, eggs, chips and mushrooms on a cold Kentucky Saturday night - Well pleased!! Nice tasting, reminded me of home, reasonably priced, and delivered quick enough to satisfy! Have these with the English Bacon for a real breakfast, add the Black Pudding and make it even better. Or just plain bangers and mash. Once again EPPC has it right. Keep up the great work. Excellent quality, delicious & a real taste of home! Thank you for a real taste of home....sausage rolls, steak pies, pork pies and bangers....all so very delicious, good quality and I will be ordering again!